This wave of success had a flip side as well: Rudi opted to not sell any of his national winners, instead transferring them to the breeding loft, where they provided him with new stars for future seasons. But this is still a tough call for any fancier; what is the best option for your team's future? Rudi was well aware that your future as a fancier lies in your breeding loft most of the time. This transfer considerably weakened his existing racing team of course, with his best birds moving to the breeding loft. At that moment, you need a new generation of champions that is ready to fill the gap. However, national winners and ace pigeons are hard to come by. Rudi used his best racing birds in the breeding loft to create future stars - he was patient but expectations were high. The premature loss of Favoriet (death) was a major blow for the team. Fortunately enough, there were some other racing birds that had already proven to be talented breeders as well: Antonio (we talked about him in a previous report), New Jens and New Tours. 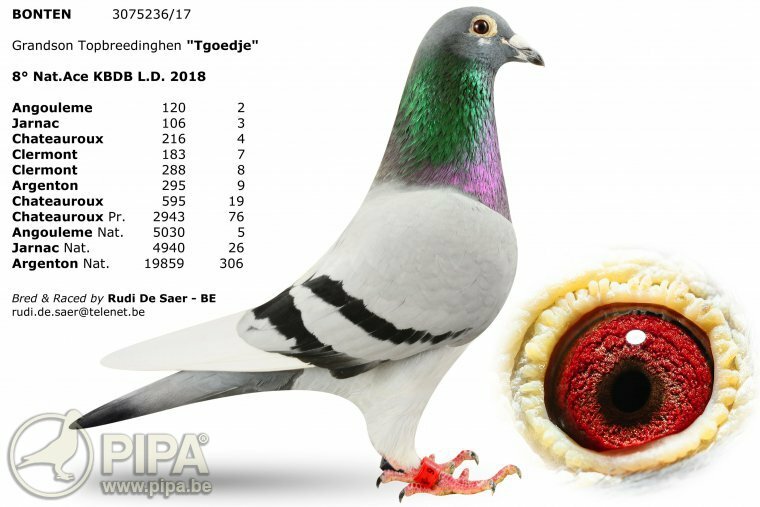 The origins of these three pigeons can be summarised as follows: the invaluable bloodline of 't Goedje, combined with the old stock bloodline of Perigueux x Corry, and some newly introduced birds that were used for crossbreedings, such as Gino’s Boy (G.Clicque), Monar’s Pride (E.Meirlaen), Amalia (Batenburg-Vd Merwe), Neymar (N.Ally) and others. 14. Nat. Tulle (623km)       4,169 p.
17. Nat. Limoges (633km)     6,492 p.
30. Nat. Tulle (623km)       7,447 p.
47. Nat. Limoges (633km)     6,272 p.
53. Prov. Tours (452km)      4,939 p.
61. Nat. Brive (668km)       9,132 p.
67. Nat. Limoges (633km)     9,162 p.
71. Prov. Chateauroux(486km) 4,532 p.
91. Nat. Brive (668km)       9,278 p.
193 Nat. Tulle (623km)       8,621 p.
A super class breeder and a son of Bleken BE07-3128456 (a 100% Gaby Vandenabeele). He won a 16th Nat. Souillac 1,039 p., a 44th Nat. Tulle 6,695 p., a 66th Nat. Limoges 10,448 p., a 1st Tours 284 p., etc. Bleken comes from stock pair 'Den 18' x golden stock dam 't Goedje. The dam of Bleken JR is Jessie Bond BE05-3177007, a daughter of stock pair 2: Perigueux x Corry. A full sister of national winners Antonio (1st Nat. Souillac) and New Tours (1st Nat. Cahors). She is a daughter of top breeder Zoon Groten BE02-3185762 x golden stock dam ’t Goedje BE05-3177035. Click here for the full pedigree of Ace. 20. Nat Brive         9,278 p.
22. Prov Chateauroux  4,532 p.
152 Nat. Tulle        9,578 p.
Winner of a 1st Nat. Limoges 13,789 p. (10 min. ahead). He is himself a son of Gino Boy BE09-3171413 x Zus 2 Jens BE05-3177117 (a full sister of Jens, 1st + 2nd Prov. Ace Pigeon KBDB). A wonderful hen and a direct Batenburg-Vd Merwe, from a pairing of a 2nd Nat. Bordeaux x 3rd Nat. Bordeaux: Aron NL10-1667385 x Amalia NL10-1666653. And there are plenty more promising newcomers in this generation of one year olds, including a number of pigeons from a crossing of the tried and trusted inbred De Saer breed, which was successfully strengthened with some other introductions. These will be particularly suited to be paired to the old foundation again. A strong team of young birds gives you plenty of options for the future. Bonten and Janco are two talented young birds that have made a name for themselves in the demanding long distance races in July and August last year. This raises hopes of some other yet to be discovered long distance champions, that can further add to the reputation of the modern-day De Saer pigeon. 5. Nat Angouleme      5,030 p. –  2. Club 120 p.
26. Nat Jarnac        4,940 p. –  3. Club 106 p.
76. Prov Chateauroux  2,943 p. – 19. Club 595 p.
306 Nat Argenton     19,859 p. –  9. Club 295 p.
A super class breeder and the sire of a 1st Prov. Tulle 1,012 p., 1st Prov. Blois 5,284 p., 1st Prov. Ablis 8,500 p., 17th Nat. Tulle 7,333 p., 17th Nat. Brive 5,285 p., and a 52nd Nat. Limoges 18,390 p. He is himself a son of the stock pair 1 of the De Saer family: Den 18 BE98-3240118 (grandson Wittenbuik – Vandenabeele) x golden stock dam ’t Goedje BE05-3177035. She is a direct Norbert & Stefan Ally. She is a daughter of Nestpender Ronaldo BE08-3081207 x Daughter Provinciaal Poitiers BE11-3050244 (from the breed of Marc Pollin; she is the dam of Neymar, winner of a 1st Nat. Montauban). 40. Nat Jarnac    4,940 p. – 4. Club 106 p.
55. Nat Angouleme 5,030 p. – 5. Club 120 p.
A promising breeder and a direct Etienne Meirlaen. He is a son of Next Ace BE13-4257803, 4th nat. ace pigeon long distance KBDB 2014, 13th Nat. Brive 3,850 p., and 30th Nat. Limoges 6,907 p. (a grandson of Cor: 1st Nat. Ace Pigeon extreme long distance KBDB 2008). Next Ace was paired to Monar's Pride BE13-4077055, winner of a 10th Nat. Ace Pigeon extreme long distance KBDB 2014. She is a daughter of Monar BE08-4298283 (1st Intnat. Narbonne 12,605 p.) x Half sister 3rd Nat. Barcelona BE11-4278214. A talented breeding hen; she is also the dam of a 42nd Nat. Angoulême 5,030 p. She is a daughter of Black Pedro 2 BE10-3183606 (the sire of Finn: 2nd Chateauroux 5,063 p. and Tigro: 1st Brive 120 p., 2nd Limoges 131 p., 71st Nat. Brive 5,929 p., and a grandson of stock pair 2: Perigueux x Corry) x Lady Bleken BE10-3183614. Lady Bleken is a daughter of 4th Nat. 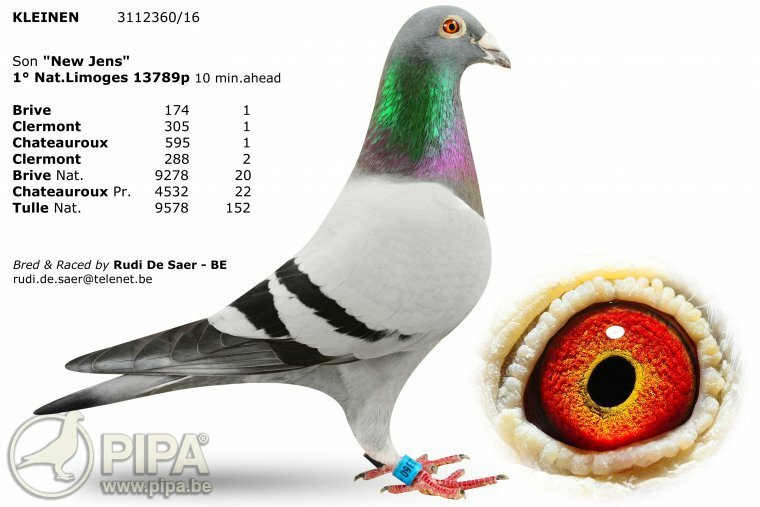 Ace Pigeon long distance KBDB 2010 Bleken BE07-3128456 (from Den 18 x ’t Goedje) x Bliksemgirl BE09-3149960 Rik Cools. 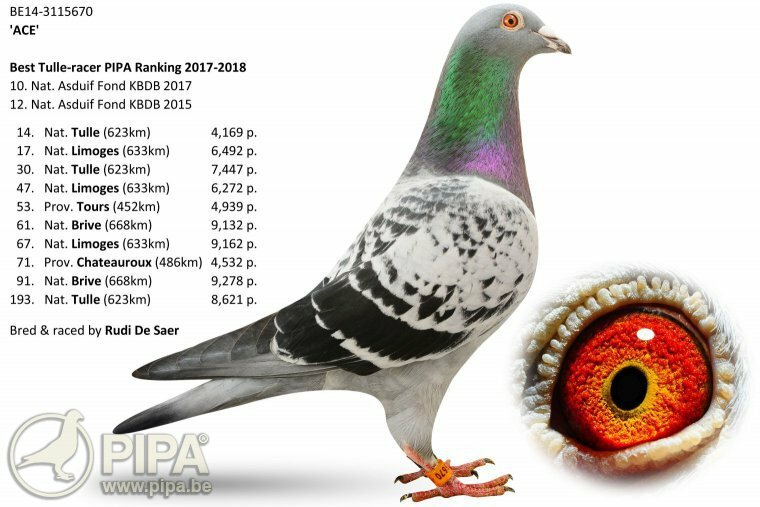 These talented pigeons have been winning numerous top prizes across the 2018 season, even at national level, and this resulted in quite a few championship titles at club level and in the national KBDB competition. The following is a brief summary of their best results. 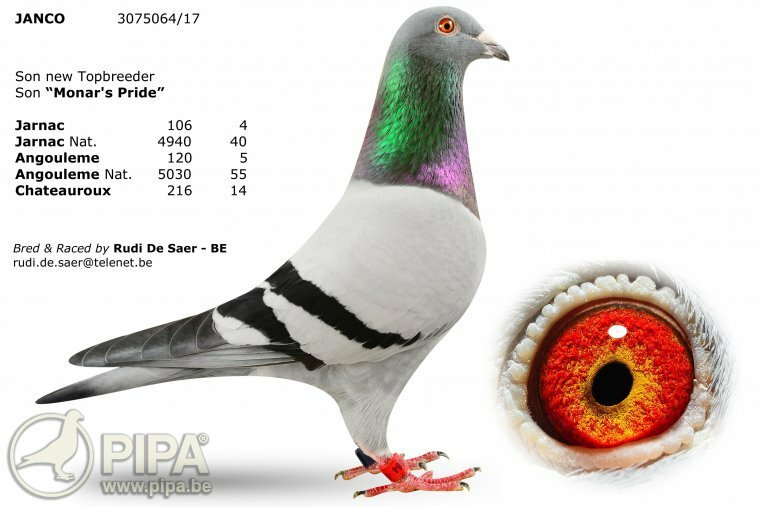 We can honestly say that the De Saer pigeon breed is as strong as ever, as one of the leading teams in the long distance. Rudi can confidently continue to expand his existing pigeon breed. Meanwhile, a number of crossings with the inbred De Saer bloodlines have already shown to have great potential as well. Remember that this is a pigeon family that has helped other teams win prizes at the highest level as well. The numbers speak for themselves, not in the least in their own loft, where Rudi is working hard to get his team up and running for the 2019 racing season. He is hoping to add another chapter to his extensive success story. He is clearly highly motivated! 3. Prov. champion long distance young birds Wvl. 8. Nat. Ace Pigeon long distance yearlings KBDB 2018.